When I was a kid in the eighties, we could be out climbing trees and building dens all day long. It’s a very different story for many kids these days who spend their time playing on computers all day. 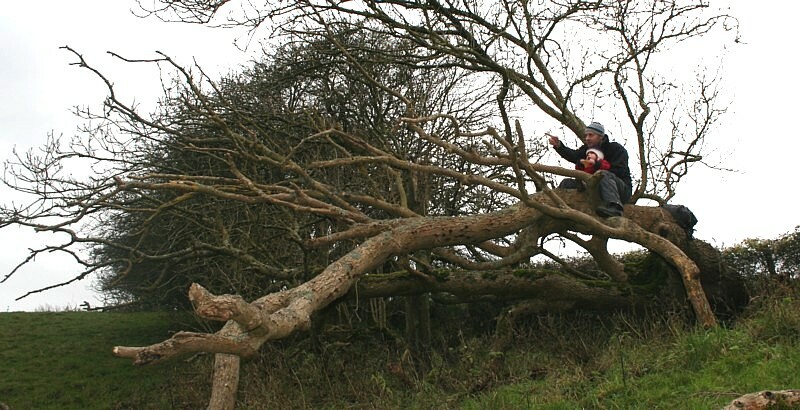 Well rant over ha ha, but kids these days don’t explore trees as much as they used to, and although there is some risk to climbing trees, under parental supervision it can be great fun! Exploring trees isn’t all about climbing them, exploring a woodland full of them is all part of this little adventure, make if a family outing and you have the start of an adventure! I took my two year old son Kaelan to a local public footpath for a walk, and this mini adventure kind of developed itself. It began when we found an old tree with a huge hollow where a branch had long disappeared. I asked him if he would like to sit in the leafy seat out of the cold wind and with a yes and a nod, he was sat eating a rice cake inside a tree. It was probably fairy warm in there too. This gave me the idea to show him for the remainder of the walk, how fun trees can be. We found a weird shaped tree with a limb straggling out from the main trunk, just off the ground, and sitting Kaelan on this, it started to bounce up and down. He loved it!! Walking a little more and now with an excited child we found an old building with huge trees growing though it, and as we entered the ruins a fox darted out and made my wife jump out of her skin, quickly followed by me and the boy! It was a big fox too!! This adventure was beginning to get exciting for the adults, and after seeing a few Roe deer bounding across the fields we stopped again on a tree which had slowly sunk towards the ground, allowing me to sit on top a limb with Kaelan on my lap. We had another rice cake and looked across the fields and back on where we had come from. It was a nice moment and surprisingly he was full of questions about what he was looking at. A rain cloud some came over and we quickly headed back to the car and back for a cup of tea, but what turned out as a short walk turned into a great little adventure which the whole family enjoyed. 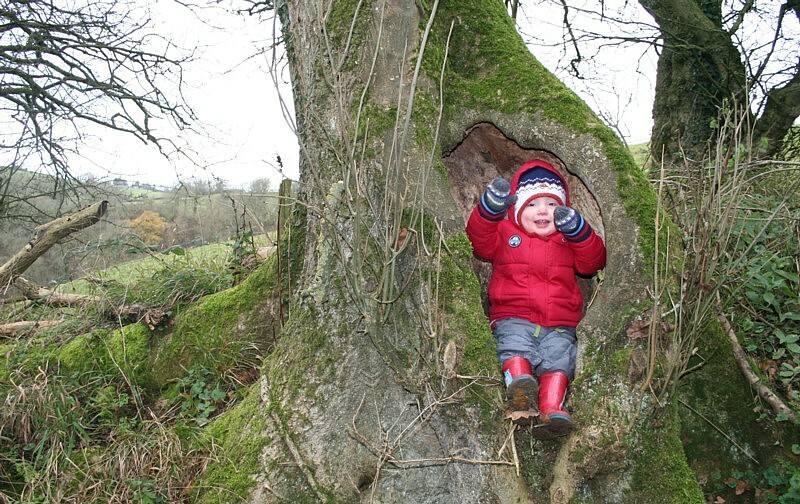 Supervised, exploring trees can really get young children interacting with the outdoors!